After years of burning or burying their waste, some cities are getting serious about garbage. Adapted from Article By David Ferry that appeared in The Wall Street Journal. Jack Eidt contributed details to the original. Across the US, a handful of municipalities are radically reducing the amount of refuse they send to landfills, with the eventual goal of reaching “zero waste.” Seattle recycles or composts more than half of what its residents toss out. San Francisco diverts 77% of its waste from landfills. Even sprawling Los Angeles recycles or composts about two-thirds of its garbage. Those numbers stand in stark contrast to the rest of the U.S., where the Environmental Protection Agency (EPA) estimates only about a third of waste is recycled or composted. The cities are getting the job done largely by having citizens and businesses sort trash more carefully, to recycle as much as possible. The prime benefits in adopting zero waste are environmental; many cities that have enacted zero-waste plans say they have taken up the task in the name of sustainability. According to the EPA, recycling and composting are effective ways for households, communities and businesses to save energy while reducing water and air quality impacts as well as landfill-generated methane, a potent climate destabilizing greenhouse gas. 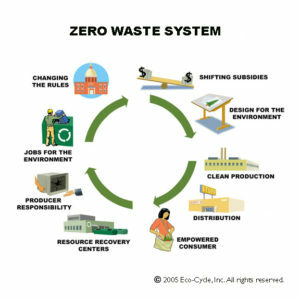 “Zero Waste is an ethical, efficient, economical, and visionary goal guiding lifestyle changes and practices emulating sustainable natural cycles, where all discarded materials are designed to become resources for others to use. As well, supporters argue that reducing waste doesn’t necessarily mean increasing costs. For cities with limited landfill space—and the higher fees that come with it—most zero-waste activities cost less than normal garbage disposal, says Gary Liss, a zero-waste consultant who has helped about 20 cities form plans to reduce waste. Why don’t cities shoot for 100% diversion? “We’re not crazy,” says Neil Seldman, president of the Institute for Local Self-Reliance, a nonprofit based in Washington, D.C., that promotes sustainable communities. The closer cities get to that goal, the harder it is to go further, largely because there are so many products out there that just can’t be recycled—and people continue to buy them. Extended Producers Responsibility (EPR) could make a difference on the production end, placing the legal, financial, and environmental responsibility for materials entering the waste stream with the manufacturer, not on the consumer or the local government at the end of the product’s or packaging’s life cycle. The end result is a fundamental shift in responsibility and financing so that manufacturers redesign products to reduce material consumption and facilitate reuse, recycling and recovery. Cities can pass ordinances and require households and businesses to recycle and compost, but “they can’t control the behavior of residents,” says Chaz Miller, the state programs director for the National Solid Wastes Management Association, a Washington, D.C., trade group for the waste and recycling industry. “There is still a lot of material to dispose of in this country, and it’s going to remain that way for a long time,” he adds. Indeed, despite increased recycling in recent years, Americans are still prodigious wasters. In 2009, the most recent year for which figures are available, Americans threw out roughly 243 million tons of trash—or about 4.34 pounds of garbage per person, per day, according to data from the EPA. After recycling, composting and incineration, about 132 million tons ended up in landfills that year. One of the most comprehensive zero-waste strategies is San Francisco’s. The city has relied on ordinances and regulations to prod citizens and businesses into wasting less. In 2009, it became the first city in the U.S. to require food composting for residents and businesses, Rather than throw food scraps and dirty napkins into the trash, individuals and businesses must chuck their organic material into city-provided green bins. The mandate led to a large boost in compost collection, says San Francisco Department of the Environment director Melanie Nutter. Recology, the city’s collection agency, now hauls more than 600 tons of organic waste to a composting facility each day. In an effort to “close the loop,” Recology sells the certified organic compost materials. San Francisco’s rules don’t end there. There’s also a mandate for waste at building sites. Construction and demolition crews must recycle or reuse at least 65% of the material from a site, which involves sorting all debris or ensuring it is hauled to a collection facility. The result of all these efforts is a waste-diversion rate of 77%—the nation’s highest—and the city is aiming for 100% by 2020. Ms. Nutter says the city can reach 90% if it prods its citizens to be even more waste-conscious; about a third of the waste that San Francisco sends to the landfill is recyclable, and another third is compostable. Officials in San Francisco say sustainability is the driving factor behind its push for zero waste. The city pays for garbage collection only from city buildings and property; residents and businesses pay for their service through fees. The city says residents pay about the same for curbside trash service as in nearby cities. Another zero-waste leader is Seattle, which diverts about 54% of its waste from the dump and hopes to reach 70% by 2022. The city mandates recycling for businesses and residents, and requires food composting for single-family residences. It has also banned the food-service industry from providing goods in plastic-foam containers, and requires single-use packaging—including plates, coffee cups and utensils—to be recyclable or compostable. Among the approved alternatives on the city’s website: drink cups made from corn, bowls made from tapioca starch and wooden utensils. Still, not all high-achieving cities get there with mandates and bans. Los Angeles diverts over 65% of its waste from landfills and is shooting for 70% by 2013. But it doesn’t mandate recycling. “We don’t believe in banning, as a city,” says Alex Helou, assistant director of the city’s Bureau of Sanitation. However, the State of California, per AB341, will mandate for them and all municipalities. After July 1, 2012, a business that generates more than four cubic yards of commercial solid waste per week, or a multifamily residential dwelling of five units or more, shall arrange for recycling services consistent with state or local laws or requirements. LA’s Mr. Helou says the bureau encourages residents by giving prizes like Starbucks gift cards to neighborhoods that increase their recycling the most. He says the city has also sought to make recycling as convenient as possible and has expanded the type of waste that consumers can throw into recycling bins to include items like plastic foam and milk cartons. Active movements in the city, however, are advocating for a stronger stance on recycling mandates. Austin, Texas, currently recycles or composts about 38% of its waste and is in the process of finalizing its zero-waste plan. In addition to considering a recycling mandate, the city has pursued an original outreach campaign. Earlier this year, “Dare To Go Zero” premiered on the city’s public-access channel. The “Biggest Loser”-style reality show challenged four families to reduce their waste by 90% over the course of five weeks. The city’s director of solid-waste services, Bob Gedert, says Austin hopes to ratchet up its diversion rate to 75% by 2020 through a mix of regulation and outreach, but says the city does not expect to reach zero waste until 2040. Officials in San Francisco, like many other zero-waste supporters, maintain that incinerating waste increases greenhouse-gas emissions, and note that incineration destroys, rather than conserves, resources. Still, many city officials agree that some sort of technological help will be needed as they get closer to zero waste. Seattle’s Mr. Croll says he is interested in anaerobic digestion, a process where micro-organisms break down organic waste and produce methane, which can later be used for energy. San Francisco is hoping to rely on advanced mechanized sorting systems that pick more recyclables from the garbage flow, Ms. Nutter says. After that, she says, it may be out of the city’s hands. “There are some items in the waste stream that can’t be recycled or reused or repurposed,” she says. “So, in that case, we think the last 10% will really come down to working with manufacturers” to reduce and rework materials packaging. With regard to recycling, history has shown that most people want to do the right thing, provided it’s convenient. The writing is clearly spray painted across the urban walls that organics collection and composting are the right thing for our communities. While these are organic processes, there will be no organic development of collection systems as these are municipal processes. Cities must clearly take the lead to engage for collection of these organic resources. Successful public/private partnerships can alleviate the cost of these programs, as there is definitely support and a demand for these programs. There is no excuse for any city to not be on board with organics recovery. As mentioned in the article, I think zero waste model like this should be world standard waste treatment process. Moreover, as Paul connett said, reducing wastful consumption must be done to prevent our earth becoming a giant landfill. For successful result,cooperation between manufacturer, consumer, processor, and govenment is very important factor. This is a refreshing article with current information that many municipal web sites would do well to include, as the need for public understanding and action is essential. Municiple composting really should be a “no brainer”, it just is not that difficult to achieve and the benefits are great and varied. Germany has 5000 operating anaerobic digestion facilities generating biogas some of which pay 10 Euros per ton for food waste. How is that possible? They have mustered the political will and have created incentives for renewable energy. Of all the environmental issues that plague us today, Zero Waste is probably the most accessible tool for self-empowerment to the common consumer. Every one of us can start to go Zero Waste. Many are almost there by being avid recyclers. We are doing a great job, but we still can do better. Recycling is the starting point, but source reduction and reuse and up-cycling are other newer aspects that have not been explored nor are as famous as recycling is. Since all of us are consumers, or are at least viewed as consumers by manufacturers, we are in a great negotiating place as we control the purse strings of what we are going to purchase or not purchase. We can empower ourselves to say “No” to an unsustainable purchase and just keep our money in our wallets until we find something that is really an environmentally friendly product and is really what we need. We have been brainwashed into having to buy everything new, when using what we already have is sufficient. We have been trained to think that wants are needs, when they are only wants: what we have is usually what we need in most cases. We have been taught that we must comply with the model of consumption, but we can fight back and fend off consumerism with a new secret weapon: the model of sustainability and Zero Waste. We are overwhelmed by the sheer scale of how big the environmental problems are. We feel powerless, but there is hope. Each one of us has the power and the ability within reach to do our share to not only save ourselves, but the entire planet. All of us are individuals but when we work together we are an accumulative force. United we stand, divided we fall. Self-empowerment is easy to do, just by doing a few simple things to change our lifestyle to become more sustainable. Recycling helps, as does reuse and reducing wastes. In fact adapting Zero Waste goals are a great start. We shouldn’t stop there: reducing consumption and especially over-consumption, before we even make purchases is critical. Reducing the use of toxic products, especially in the manufacturing process is also very necessary, though not a total solution, it still contributes greatly toward the greater solution of trying to achieve Zero Waste. It would be very helpful to also eliminate all unnecessary garbage such as plastic shopping bags, Styrofoam (polystyrene) and other toxic items such as poly vinyl chloride, BPA’s and Phthalates from products that are used every day by consumers, and thus enters our waste streams. Much packing is incredibly overdone and needs to be drastically reduced as well. A good and easy Zero Waste practice is to substitute Styrofoam peanuts with popcorn. It is cheap and edible if fresh, and very compostable if stale. Not only is it an effective substitute for Styrofoam peanuts, it is easily managed either by being eaten by humans, animals, or microbes if composted. It is important to have mindfulness with every decision that we make: from making everyday food choices to deciding where and how we will live. Knowing that every decision that we make should help us become more aware of how much power we actually have. Minor fine-tuning of our lives for more sustainable behaviors can cause dramatic changes for the better for all of us. We are all empowered. We can change the world for the better, each and every one of us. If each of our actions were likened to pennies in a bank account, then all of our actions are accumulative and accrue interest. The interest we accrue is the wastes that we produce, downstream. The principle in this bank account can be likened to the 70 pounds of wastes produced upstream even before we even purchase a product, which may weigh only one pound. As mentioned in the Wasteberg concept, we need to reduce our wastes and think twice before purchasing that item that was made to last only a very short time, but is loaded with toxic chemicals that cannot easily be managed at the end of its life. Just think about another bank account analogy: if each one of us were pennies in a ten billion dollar bank account, then we all add up. All of us, though we are individual pennies, are important. Like the pennies, all of our behaviors on this planet of nearly ten billion people are like those pennies that all add up to thousands, millions, and billions in that bank account that we call Planet Earth. Don’t overdraw upon your environmental account! Be responsible and sustainable. Your very life depends upon it. Don’t close out your Earth Bank Account. Learn how to do more to help protect your habitat and save the Human Species from extinction along with the rest of the planet from extinction as well! We must halt the thought that wastes are wastes, when they are really resources and/or feedstocks for other making other products. Don’t trash our Earth. Refuse to engage in over-consumption! Reduce, Reuse, Recycle, and UP-Cycle! Make Haste: Go Zero Waste! Recycling pretty much has been an issue since we started making and using things. However, I think about the big picture, yeah, the most powerful people, in this case, the big companies like Apple. I love Apple and use their product, nonetheless, I won’t deny that this company is just outrageously rich, TOO rich and yet what they do for the environment is very little, not to mention that their ewaste is just one of, if not, the one that consumers uses the most around the world but what do they do? Not much, yes I understand that the most important factor int he success of recylcing program is the participation by consumers, but just the way Apple educates us about their great devices, please, take it as challenge to let people know that once their product is discontinued (that means in about a year) then you MUST properly thrash it. Because we can’t expect apple to practice Down-cycling out of blue, though they have a section for refurbished products. Main point is that these great companies brag about their wealth yet do so little for the environment and they are the first ones to endanger our planet. Pretty interesting article to read. What comes to mind for me to make this a more concentrated effort, is that people simply have to be more conscious. Conscious in thought, mind, body and spirit. Then it will hit home how essential and vital that we all as a major consensus must make drastic steps to be more sustainable, environmentally conscious. Most neighborhoods in my city, the apartments and homes are squashed to each other. Living in an apartment building with extremely narrow roadways, and place for garbage makes it a true challenge to put in place a suitable system. In a previous apartment, I lived in I was on the phone practically everyday for several weeks begging the City to bring out recyclable containers to our complex. It took about 4-6 months. That is discouraging. Cell phones are a major menace to sustainability and the environment. These items are built to fall apart and roughly six to a year if one is not careful you have to toss out the phone and buy a new one. Talk is cheap and actions speak far louder. I hear the talk in my city about making these changes, however the lunacy of how some things are done makes me wonder. People still want convenience, and glory with very little work from what I see. To make these changes, it is going to take a bit more than that. -YES! I fully agree! It’s unfortunate that the only way to get people to to the right thing is by forcing ordinances and regulations. Maybe people don’t see the power that lies in each individual. Articles like this are important in educating the population about zero waste and making it relevant. Thanks David Ferry! I think it is interesting that San Francisco is attempting to achieve 100% zero waste by 2020. The last 10% would contain products that are difficult to reuse or recycle. Plastics used in medical care are a prime example. They are necessary to provide healthcare but the only destination for them seems to be a landfill. Los Angeles is almost four times as long and will try to achieve 90% zero waste by 2030. I am skeptical this can happen if the city cannot implement a program to remove plastic bags from the waste stream. I am curious how other parts of the country will view California as a leader or the crazy tree hugger state. Many parts of the country interact with the environment even though they may not consciously realize it. Explaining why zero waste and its substantial impact on the environment could be a difficult sell in comparison to something with more tangible benefits like health care or education. The article is great, but I would focus more on reducing, and reuse instead of more in recycling. Recycling is great, but that is the last step before going to waste. We should focus more on the first step before going beyond. Reducing should be our priority in order to make a huge impact in also reducing the uprooting of our virgin resources. Also if our scientist can learn more from mother nature, then if not a perfect close loop it will be close enough. And most important of all, one branch of our society wouldn’t be able to make a huge dent with this endeavor. We should all pitch in. Government, politicians, business people, non-government organizations, consumers, the media, educational institutions, and political institutions should work together for this to become successful and be able to sustain our planet. We are getting a good start for letting people become aware of our earth sustainability problem, but we should do more by making BIGGER NOISE consistently and continuously. We should do it with enthusiasm, applied faith, and purposeful action to not steal from the future generation, but instead contribute for them. Legislating for a Zero Waste goal certainly seems to be the way to get the ball rolling for a sustainable future. It gets the conversation going, and the general public thinking in those terms. I think that left on their own, people who don’t already think about reuse and recycling wouldn’t give throwing things away a second thought. I was quite surprised by the comment from Alex Helou, assistant director of the city of Los Angeles’ Bureau of Sanitation. Not believing in “banning as a city” seem ludicrous to me. How does he think that LA will reach its zero waste goals without a mandate about recycling? I’m guessing that the State legislation and AB341 has come to the city’s rescue, to say the least. re:”Urban Quest…most interested in Seattle requiring single-family homes to compost food scraps. Would like to know the mechanisms involved: bins, collection, costs, etc. Here is a link from the city of Seattle..
How cliche it may sound to restate the quote “out of sight, out of mind”, however big cities such as Los Angeles who are not that fond of zero waste and don’t take heed to the growing environmental struggles of both the nation and the globe will ultimately suffer over the monetary benefits of burning of burrying waste. Lastly, though i know there is an extreme cost difference between throwing waste in landfills and composting/recylcing, but is anyone aware of the disparity? Hey David Ferry! It’s amazing to read that San Francisco is attempting to achieve 100% zero waste by 2020. Love the Post. I think recycling and composting are effective ways for households.